Today is my daughter’s birthday (12) and this is THE CAKE. This is her favorite cake and she has asked for it every year for her birthday for the past four years. 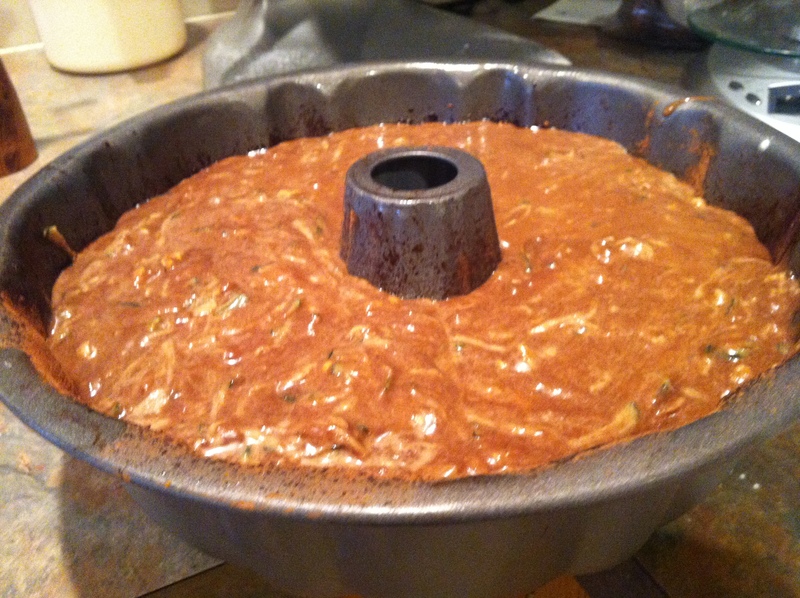 Two years ago, I had to borrow shredded zucchini from a friend to make the cake in January. Last year, I bought semisweet chocolate instead of unsweetened chocolate, so that same friend and I had extensive discussions and research about how to adjust the sugar so the cake still worked. Thanks Tara, I’ll have to bring you a piece; you are a big part of the history of this recipe! Last August, when we were making zucchini brownies, my daughter even grilled me to make sure we had enough shredded zucchini left to be able to make the cake in January. Five months in advance!! That is how important this cake is to her. I thought the original recipe was in Cooking Light, because that is a magazine I actually get. But I have been unable to find it there. Online research has turned up a version from Southern Living (owned by the same parent company I assume), but I have never seen that magazine in person and don’t know how I would have come across that. Beat the eggs in mixer. I used my Kitchen Aid with the heavier flat beater rather than the whisk because the final batter is pretty thick, more of a dough than what I usually think of as cake batter. Gradually add the sugar, beating until blended. Next add the melted chocolate and oil, also beating until blended. Gradually add the flour mixture, beating on a low speed until combined. Removing the bowl from the stand mixer (if using a stand mixer), fold in the zucchini and the nuts. 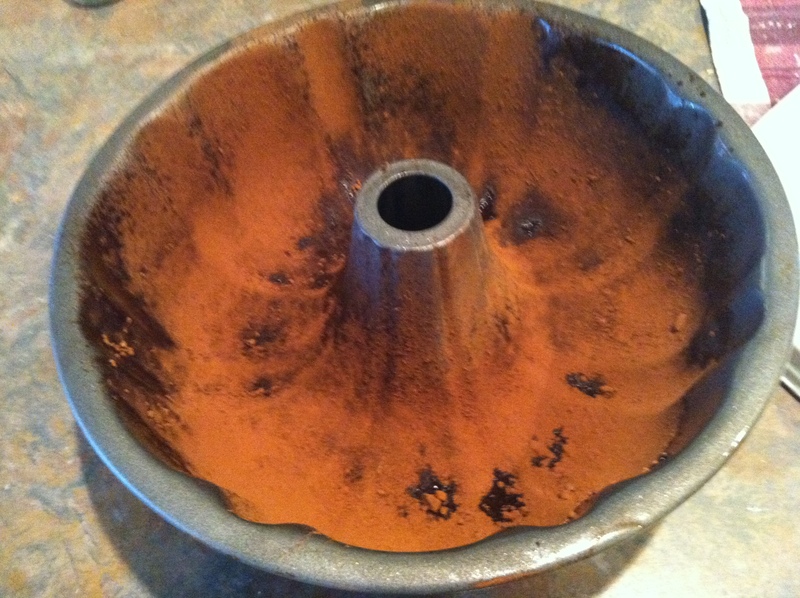 Prepare bundt pan by spraying with non-stick cooking spray, then flouring the pan with cocoa powder. 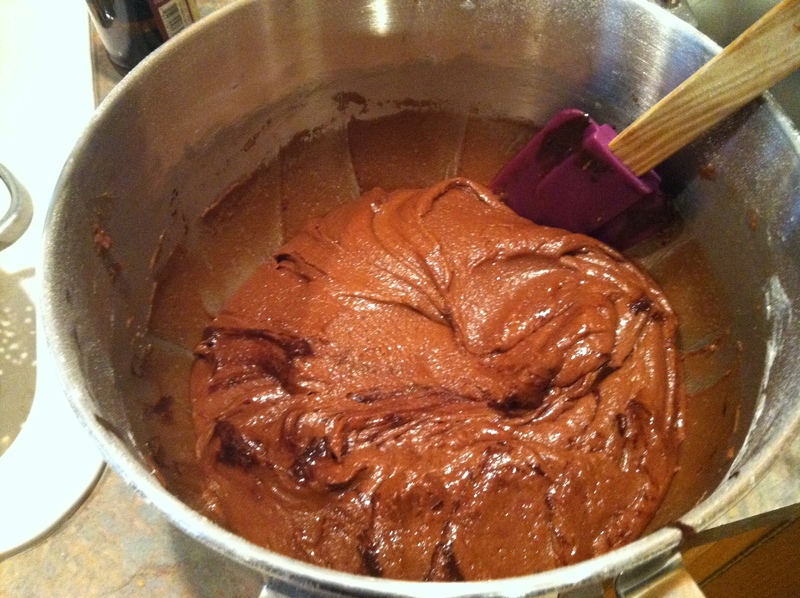 Transfer cake batter into prepared bundt pan. Bake for 1 hour 15 minutes, or until a toothpick inserted in the center comes out clean. Today that took an extra 13 minutes. It looked gorgeous coming out of the oven! Let it cool in the pan for 15 minutes. Then carefully flip the cake onto a wire rack and allow it to cool in the pan on the rack for a while until the cake releases from the bundt pan. (The first couple of times I didn’t do that and the cake stuck. Not so party perfect, but it still tasted good). 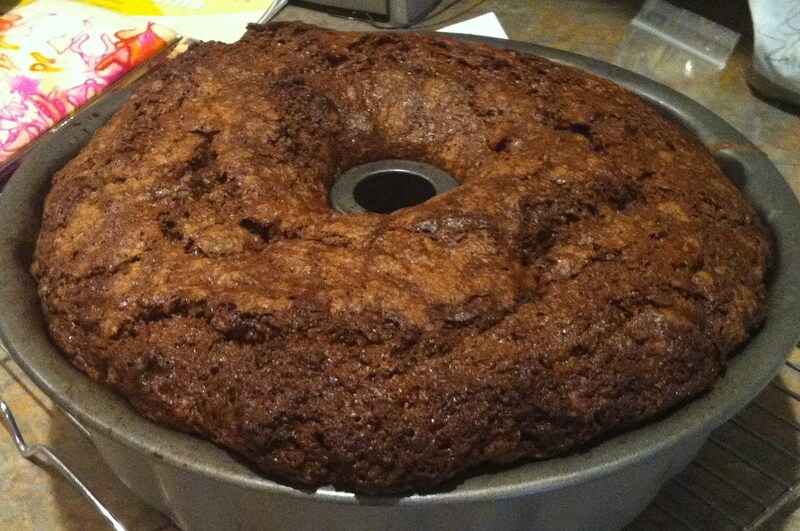 Allow the cake to completely cool on the rack, then sift powdered sugar over the top, if desired. We usually cut thin slices using the bundt mounds as a guide. Thin slices are plenty! My daughter doesn’t tell her friends the cake has zucchini in it. Although, if she did it might cut down on the midnight cake raids from any army of ‘tween girls during the birthday sleepovers. More for me that way? Check out Heather’s “What’s in the Box” party to see how others are using their CSA treasure’s. 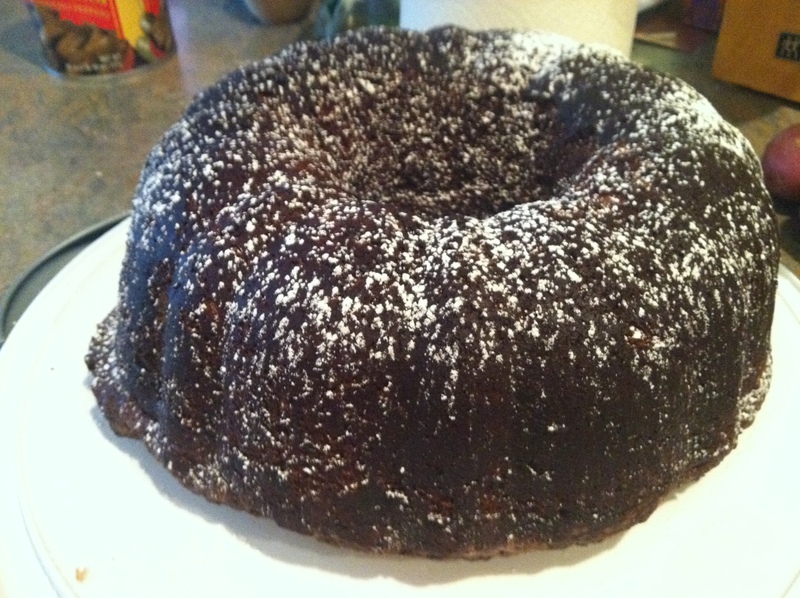 This entry was posted in Recipes and tagged bundt cake, chocolate, shredded zucchini, zucchini. Bookmark the permalink. How did you know that I’ve moved from the Strategic Winter Squash Reserve to the bags full of Squashzilla in the freezer? This recipe comes at a perfect time for me–I have an amazing amount of zucchini and we love chocolate. I just don’t have any all purpose flour, just whole wheat and bread at the moment. Wait a minute, I have a box of cake flour . . . crazy idea, I could make a cake with it! Thanks! Nice work… makes me want to bake one… I have zucchinni in the freezer. Problem is then I would want to eat it too! Yum! What a great combo! Don’t you love how many things you can do with zucchini? I’ll have to keep this in mind for the next time I get zucchinis! I love bundt cakes, too. They are just so pretty. Update: when baking in a convection oven, it cooks in waaaay less time. At about 45 minutes the aromas changed from “yum, chocolate-y” to “hmm, is that burning?”.